Norfolk Contemporary Portrait photographer, Debby Besford, showcases a rich and magical portfolio of images specializing in, Contemporary portraiture, Reportage style weddings and Editorial. This photographic project is in its primary stages and will take a number of re-visits to discover the many layers that make up the centre and the people. It is a privilege to be working alongside the staff and the boys and have permission to continue to explore in-depth this special place - the only one of its kind in France. My work investigates a complexity of issues about the representation of the contemporary female with emphasis on the Burlesque Stage Performer. This naturally led onto questioning the idea of play between photographer, private space, intimacy, fantasy and the real, as well as the mystic of the performer. This body of work has evolved from a deep-rooted curiosity about female sexuality and how this can be expressed in a positive way. 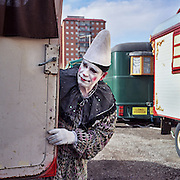 Circo Raluy is one of the oldest travelling family run circus in the world. The people gave me access to their daily lives in Barcelona, Spain. A personal documentary photography project about Artistic Roller Skaters. These young people are dedicated to their sport and stand in a moment of glory in their home environments. Roller skating demands similar technical elements to ice skating and needs to be highlighted as an important and highly skilful sport.